Is driving with the windows down bad for hearing? Driving with the windows down may be the chorus of a popular country song, but did you realize it’s bad for your hearing? 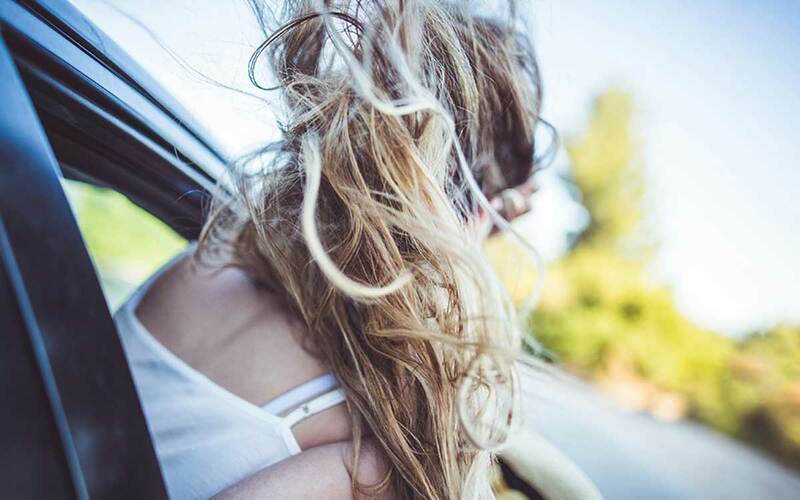 Read on to discover when it’s safe to roll down the windows. It’s a peaceful early morning around 4:45 AM. Most people are still asleep. You practically have the highway to yourself, moving at a leisurely 55 MPH with the windows down…It just seems silly to run the car air conditioner on such a beautiful day. Why would you waste the gas? But is driving with the windows open bad for hearing? Don’t believe it’s really that loud? British scientists tested everything from a Mazda to an Aston Martin in non-rush hour traffic going 50, 60 and 70 MPH. They found that regardless of speed or model, when the windows were down the driver was exposed to a nearly constant 89 decibels of noise. You get it. Cars are loud. But is this enough to cause permanent hearing loss? Yes, 85 decibels is enough to cause permanent damage over an 8 hour period. If you’re in busy traffic, where you’re consistently being exposed to over 100 decibels, permanent damage occurs within 15 minutes. What Factors Contribute to the Noise When Your Windows Are Open? Your car may seem that loud, but there are a lot of factors that can really increase the decibel noise. Gas engines work by producing a series of rapid explosions in the cylinders. In about 80% of gas-powered cars engines produce about 85 decibels of sound. The kind of car you have makes a difference. If you have a hybrid, electric or small 4-cylinder engine, your car may be quieter. On the other hand, Ferraris can produce over 100 decibels in first gear. When you have your windows down, there’s nothing between you and the sound of the engine. In addition, the car vibrates as it moves, producing even more noise. Wind resistance adds to the noise mix. The swoosh and whistling sounds of wind moving across your vehicle can significantly increase the noise level even if you have a quieter car. A study performed by Henry Ford Hospital Department of Otolaryngology found that cyclists are exposed to 85 decibels of wind resistance as just 15 miles per hour. If a cyclist gets up to 60 MPH, the sound is as loud as 120 decibels. A car has even more wind resistance than a bicycle. So when asking, Is driving with the windows down bad for hearing? The answer is an emphatic “yes”. Every time another vehicle passes you, even on a 4-lane highway, the sound is magnified. Not only do you hear the engine of the other vehicle. You hear their wind resistance. Noise is worst in these cities. Try this. Ask your passenger to use a sound meter app on their smartphone while you drive to see how loud it is in your car. Sound is always louder on the driver’s side because you’re closest to oncoming traffic, so keep that in mind while tracking decibels. On the sound meter, they’ll see the sound level spikes each time a vehicle passes. Semis and loud motorcycles are among the worst. A passing vehicle can expose you momentarily to over 100 decibels of sound. If you try to turn your radio up so you can hear it over street sounds, then your radio has to be louder than the street. That means the radio may be at 90-100 decibels. The Doppler effect happens when something loud is compressing its own sound waves. Its moving faster than they can. This changes the frequency of the sound you hear. That’s why you hear a vrooooom sound that seems to change as the car driver gets closer and then moves on past you. The sound coming out of the car is the same. But the sound waves got compressed. Very high and very low-frequency sounds can damage your hearing at a lower sound volume. The Doppler effect amplifies sound. It takes sound to its frequency extremes, which is even louder when your windows are open. Can we guess why you drive with the windows down? Ironically, many people leave the windows down because they think it’s the smart thing to do. They’re not asking, Is driving with the windows down bad for hearing? They’re often thinking about the practical aspect of things. It’s true that the car AC uses gas. But does it use more gas than the drag caused by rolling the windows down? The Mythbusters, a popular TV program on the Discovery Channel a few years back actually disproved this myth. They put precisely 5 gallons of gas into 2 identical SUVs. Then they drove the vehicles at a consistent 45 MPH until both tanks ran out of gas. The SUV that had the AC on with the windows up got an extra 15 miles on that 5 gallons of gas. That’s the equivalent to saving a whole gallon of gas. Wow. Driving with the windows down also wastes a lot of gas. If you do this all the time, you may be wasting 3-4 gallons of gas out of every tank. The other main reason people drive with their windows down is because it makes them feel young and alive, especially if there’s a great song on the radio. Some people even have convertibles to experience this feeling. While it’s important to do things you love to do without the weight of fear, it’s essential to understand the risks and reduce them as much as possible. Let’s look at how to do that next. If you love to drive with the windows down or top off, there are some steps you can take to reduce your risk of hearing loss. If you’re on a long road trip, take regular breaks and alternate between windows up, windows down. Even if it’s far from an 8-hour trip, it’s a smart preventive measure to give your ears a break. If you have a convertible, rolling the windows up with the top down is enough to get sound below damaging levels. Keep the windows up in heavy, moving traffic to avoid prolonged exposure to sound over 100 decibels. Remember, 15 minutes is all it takes to damage your ears when the noise is that loud. Never try to drown out noise with music. It’s much louder than you think. Wearing headphones or earbuds while driving isn’t just dangerous for you, passengers and other drivers. It also amplifies the damage caused by drowning out the noise with music by turning it up. If you’re riding a motorcycle or even a bicycle in traffic you face the same risks. Get a helmet that is designed to reduce traffic sounds. Get your hearing tested. If you’ve been driving with the windows down for most of your life, you’ve been very slowly giving yourself hearing loss. Sometimes it’s so gradual that we either don’t realize it or want to admit it. It’s better to know where you stand. Talk to a hearing specialist about solutions to improve your hearing. Is Driving with the Windows Down Bad for Hearing? The short answer is “yes”. When those windows are down you’re exposed to engine noise, wind noise, other vehicles and even your own radio trying to block it out. Take precautions and keep hearing at your best.